Today Altenew released their newest Build-A-Flower: Cattleya. For my card, I stamped the outline image in black, did a bit of masking and stamped the image a few more times to make a fuller border. Next, I stamped in the layers. For the pinks I used Cherry Blossom Oval Inks and for the purples I used Shades of Purple Oval Inks. After I was done stamping the layers, I took Ocean Waves and Sea Glass Artist Markers to colour my background. I kept the colours dark on the top right and reduced the concentration diagonally. In the end, I added a few black paint splatters and stamped the sentiment. I loooove this new stamp set. 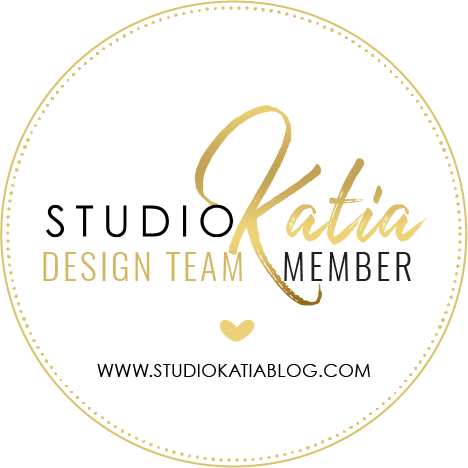 I have used it on another project and I will be sharing that with a video on the Altenew blog on 7th. Don't forget to check it out. I hope you liked my card, I really do! I am giving away a $20 gift certificate to the Altenew store to one of the commenters. I will announce the winner on 5th August. Hop on to my Instagram, I am giving away a Wildflowers Garden Stamp Set away. Beautiful card and thanks for the giveaway! Wow! This is gorgeous! Love the pretty flowers and the soft blue background is what highlights the flowers so well! So stunning, you used one of my very favourite colour combos! Your coloring and this card are just stunning! And so vibrant. Wow, so pretty love this background and the design. This is so beautiful Erum, I love these BAF sets, they are all so beautiful. The splatter looks so nice on this. Well done. OMG - this is drop dead GORGEOUS! Fabulous card, Erum! Stunning card. The floral is so unique. And, the color palette is gorgeous. Thank you for sharing. Wonderful card. Love the beautiful colors. Simply stunning. Love the vibrancy of your flowers. So pretty! Your color choices are perfect for the Cattleya! So pretty! The colors are perfect for the Cattleya! What a stunning set! Wow! The colours are stunning. ABSOLUTELY GORGEOUS card! I really love the colors that you chose for the flowers and the blues for the background it just so beautiful looking and I like how your went from dark to lighter with the background blue it really makes it look so good! 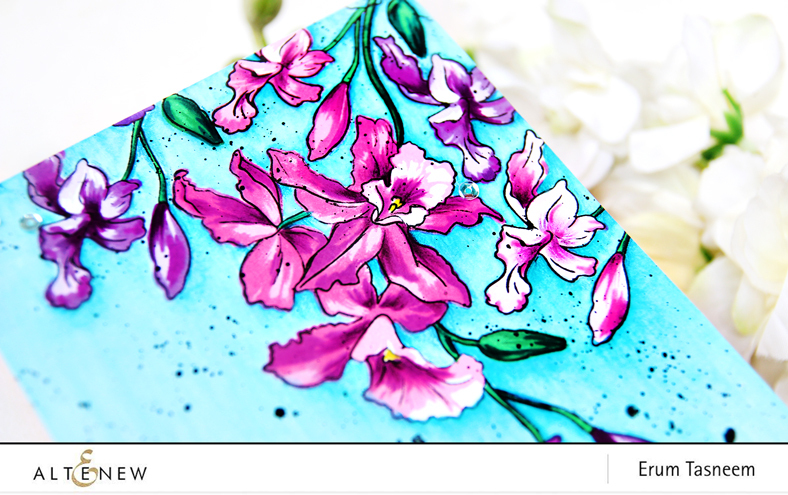 Such pretty coloring on your beautiful card! Love this Cattleya set! Wonderfully gorgeous and vibrant! Stunning water coloring! What a lovely card. I especially like the way you did the background. I'm in love with this release. Absolutely gorgeous! 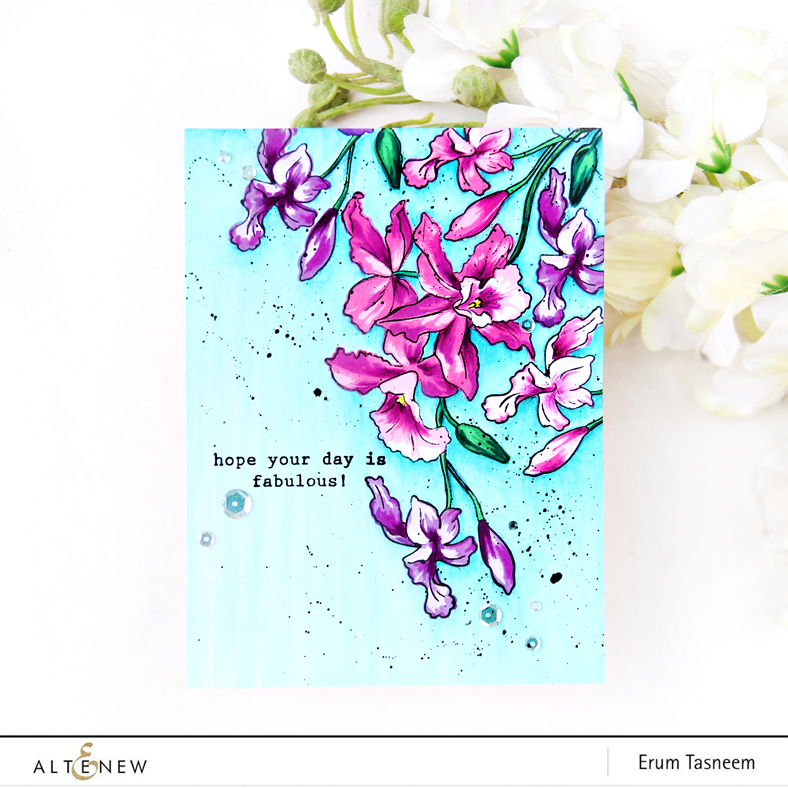 Gorgeous card with this new stunning BAF set and I love the gradient background on the diagonal! I'm excited for another video tutorial, thanks so much. 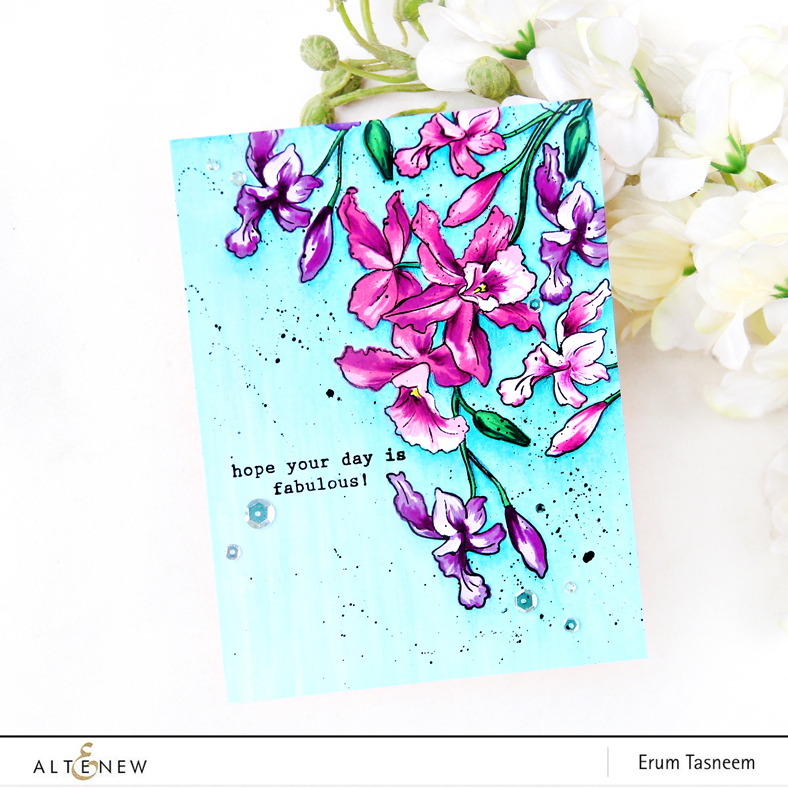 Gorgeous card Erum! 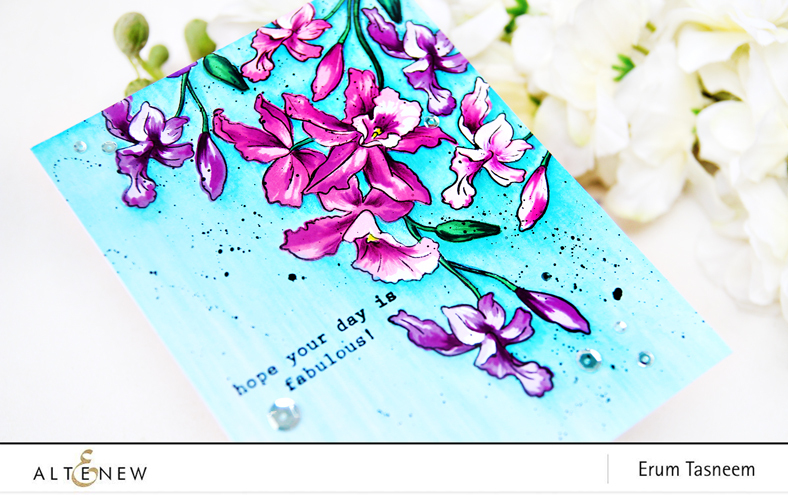 I love the colours and the paint splatter adds such a great accent to your card! The pink and purple against the turquoise is such an awesome combo. Love what you have done with this new stamp! And I like that the flowers are now numbered to make for easier use. Thank you, Altenew! Beautiful card, the Cattleya flower is new to me. Love your coloring on this new flower set! So bright and bold and striking! I love these colors together! Absolutely gorgeous card! I love the color of the background, So beautiful. Thanks for the inspiration. Am loving that you masked the images so as to use 2 different ink sets! Great idea with one main grouping! Love these orchids in pinks and purples especially!! 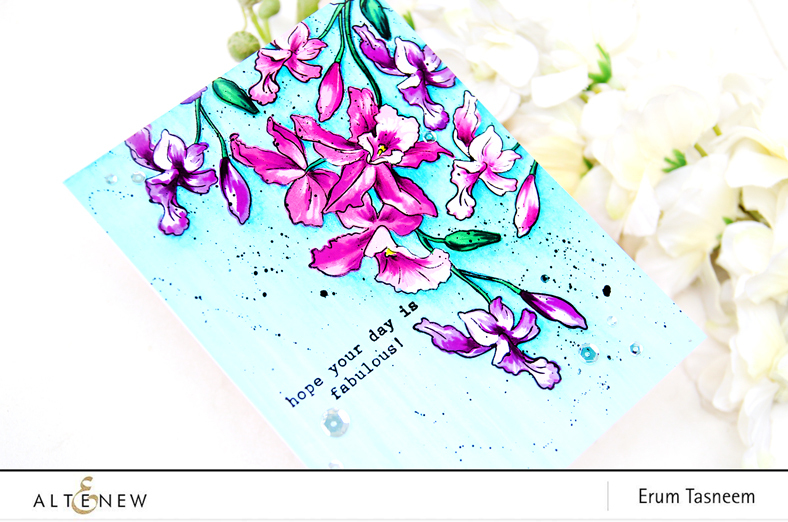 I love the shades of purple on the blue background So pretty and really highlights this gorgeous flower stamp. This is so lovely. I really thought that background was some kind of pre-printed paper or somehow separate from the flowers, because your blending was so perfect. Thanks for sharing this lovely piece with us! the blue background with those pink and purple flowers is so pretty, Erum! Yu are sooooooooo right, your card is STUNNING! Wow just WOW! Your card is stunning. Love the layout and color choices. Thanks for the beautiful inspiration!